The Waterhole Rituals Program is a method of training horses at Liberty that I developed through my observation of Wild Horses. Liberty horse training is a way of connecting with your horse without tack, in a free and open environment. The student’s focus is on growing their understanding of how to connect, communicate, and train a horse while being present in the moment. When horse and human are present in the moment they both experience a much deeper sense of well-being. Nancy Zintsmaster, my business partner and student of the Waterhole Rituals, shared a story with me the other day which shows how the Waterhole Rituals can bring a horse sense of well-being. Nancy rescued an old mare, named Luce, and her three offspring, a few years ago and began working with all of them at Liberty, except the older mare, for whom it seemed that daily life was challenging enough. She had 10 foals in her life and was in very sad condition when Nancy rescued her. She looked worn and was in very poor health. She moved very little and hung by herself in the pasture. She had a half closed eye lid that Nancy had to clean daily as some of her eyelashes turned inward and were irritating her eye. She felt working with her and training her at Liberty was too much for her to bear. 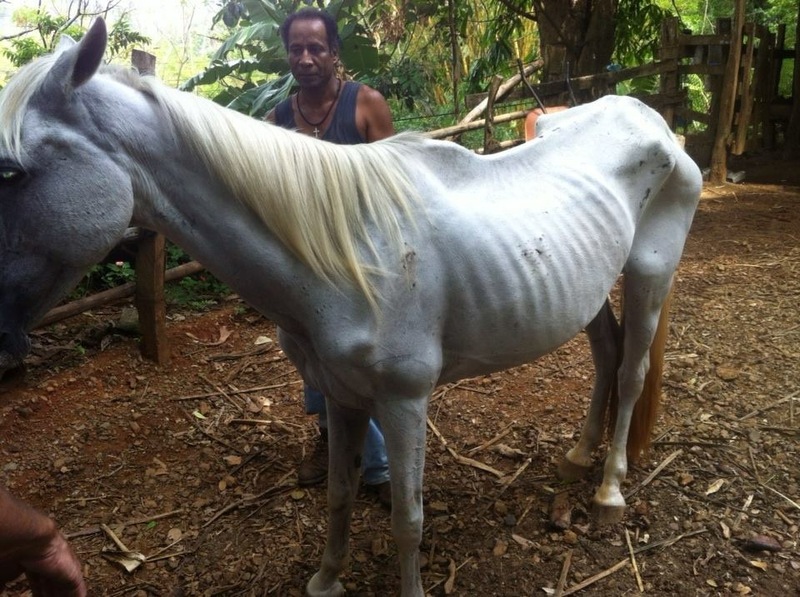 She cared for this mare’s needs to the point of indulgence, as she felt so sorry for her. Several years after the mare was rescued, other than being in good health, she still did not seem much better in spirit, so Nancy thought she might try introducing her to the Waterhole Rituals. She had initially held back from introducing the Waterhole Rituals because some of the Rituals are challenging for a horse; in particular the ones where a horse must figure out how to work within the conditions you set for them to get to a food source, giving the horse the ability to control the food source, and others that require physical participation. More than simple exercises, the Waterhole Rituals are bonding rituals that I learned from horses in the wild. They seemed to create harmony within the herd. When Nancy introduced Luz to the Waterhole Rituals she saw her mare come to life right away and immediately look younger and more vital. On the third day when Nancy walked up to the pasture in front of her house, before she even had a chance to open the gate, guess who came across the field to great her? It was the new and improved, younger spirited mare that for years had looked like she was on her last leg. Even her eyes seemed better, brighter and more curious! I felt this was a good example to show how living in a pasture is not enough for a horse. Horses are adventurers; they are nomadic in their natural state which brings adventure into their everyday lives. Just living in a pasture with friends and having all of the food they can to eat does not provide enough stimuli for a horse to stay in shape and feel a sense of purpose and overall well-being. Life has more meaning for horses when we can bring added purpose to them through the rituals that horses enjoy sharing with one another. By sharing these rituals, a cross species connection is formed where the horse develops a bond with you deeper than those he shares with other horses. In pasture life where horses are unable to live nomadically; they can easily become bored with each other to the point of losing their desire to interact with one another. Getting to play the same games with a human partner that horses experience naturally in the wild challenges the horse, helps them to grow a sense of self, by satisfying their need for adventure and enables the horse to express its opinions and true nature. With the Waterhole Rituals a horse can build a partnership with you that brings him well-being and gives him purpose. So who are the Waterhole Rituals for? They are the foundation of healthy communication between horses and humans and teaches both how to work together to form an amazing partnership. The Waterhole Rituals are the foundation of any and all Equestrian pursuits.